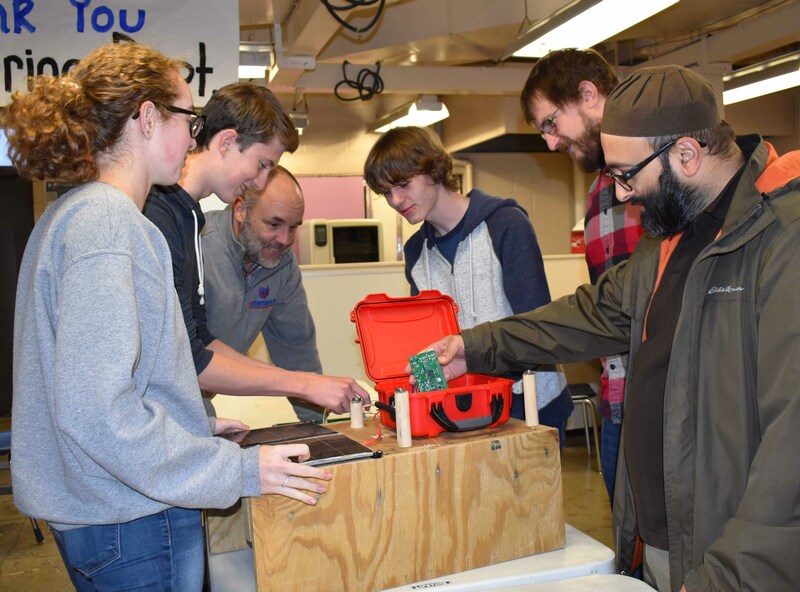 Students at a central Ohio high school have been given a tall order: Design a set of low-cost air quality monitors for installation on their school buildings to transmit data that will be used for curriculum and by the general public. The assignment came from two Ohio State professors—along with a promise to provide expertise and assistance. In 2016, Civil, Environmental and Geodetic Engineering Assistant Prof. Andy May and Environmental Health Sciences Assistant Prof. Ayaz Hyder received grants from the National Science Foundation and Ohio State's Sustainable and Resilient Economy Discovery Theme to deploy low-cost air quality sensors. A unique facet of the project is that the professors work with a team of citizen scientists: the high school seniors and their engineering teacher, who also will help develop teaching materials using the sensor data. 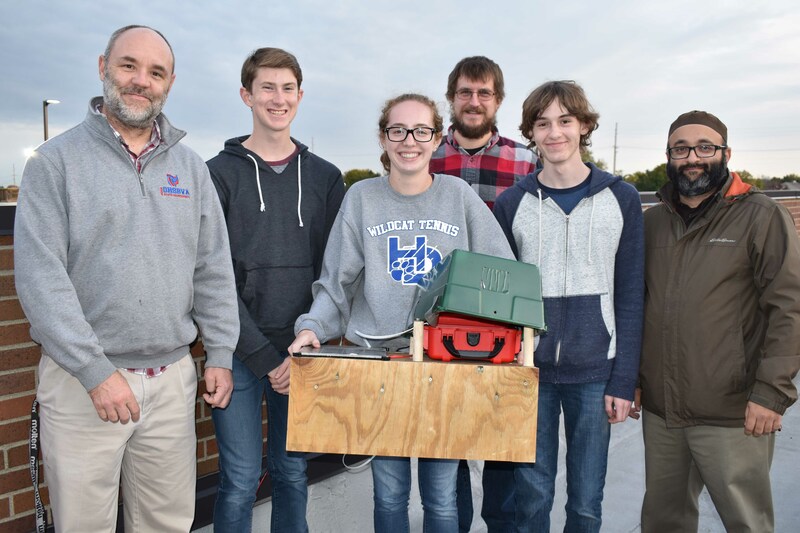 At Hilliard Davidson High School, (from left) Emma Wood, Zach Augustine, teacher Rusty Herring and Ben Charlson work on an air quality monitor with Ohio State professors Andy May and Ayaz HyderThis is one of 13 capstone projects for the seniors, who are participating in the school's Project Lead the Way program. 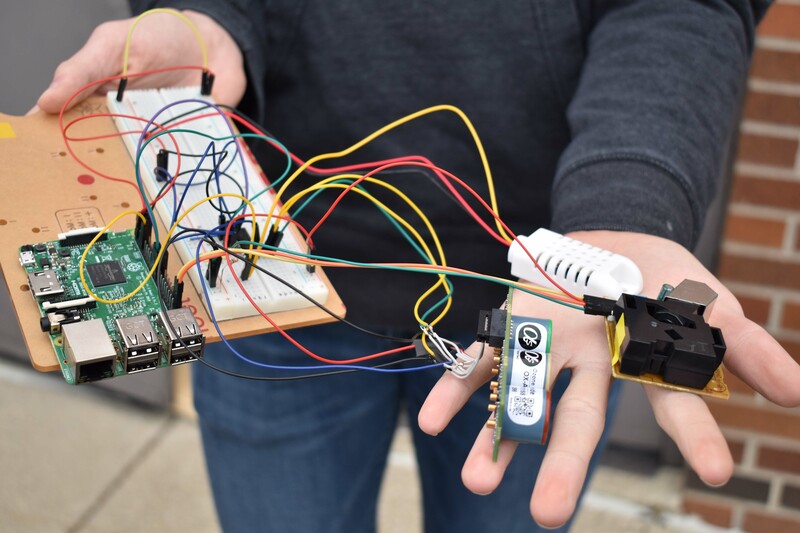 “The students are learning electronics, programming, sensors, information technology, project management, documentation, logistics and communications,” said Rusty Herring, engineering teacher at Hilliard Davidson High School. He is an Ohio State alumnus with a bachelor’s degree in welding engineering and a master’s degree in education, which he obtained after working in project management engineering for 10 years with Procter & Gamble. Internal wiring and components that will collect data on gases, particulate matter, and temperature and humidityZach Augustine calls himself the technical expert. “I’ve taken a lot of design courses and learned CAD to work on the 3-D modeling,” he said, noting that he’s designing the sensor enclosures. Ben Charlson works on the air quality monitors’ internal wiring and components that will collect data on gases, particulate matter, and temperature and humidity. May, whose research interest is the fate and transport of atmospheric pollutants, explained that the sensors will monitor carbon monoxide, ozone, nitrogen dioxide and particulate matter in the air. Last year on campus, he worked with students and faculty mounting an air quality sensor suite and accompanying hardware on top of a Campus Area Bus Service (CABS) bus. The project will demonstrate how engaging with the public can help translate “smart” science to actions of consequence, such as avoiding areas with poor air quality or identifying potential solutions, said Hyder, who determines where the monitors will be placed so the collected data can be compared with socioeconomic factors. “I’ve always struggled with the idea of equity. ‘Smart’ doesn’t just mean better. Are we doing things in an equitable manner?” said Hyder, who was hired at Ohio State as part of the Translational Data Analytics Institute. He emphasized that public health studies on air quality should be keenly aware that the lowest socioeconomic levels are at the highest risk of exposure and yet also the least equipped to cope with related adverse health outcomes. Once the data is collected, May, Hyder and the Hilliard students, with Herring, plan to leverage it beyond the engineering courses to science and math classes in Hilliard high schools and middle schools and then outside of the district. May is working to install two more sensors with Columbus Public Health and teachers at both Worthington Kilbourne High School and Thomas Worthington High School, who want to use the collected data in biology and environmental science classes. May and Hyder will be integrating the project in Dublin City Schools’ new STEM-focused Emerald Campus. Mike Faltas, who is a second-year Buckeye studying mechanical engineering, made sure he passed on the design work he had completed with the air quality monitors' enclosures. "As I passed the project down to the next group of students, I worked heavily with them on creating a better design than what we had in place," he said.